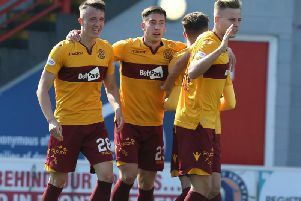 Motherwell fought out a 1-1 Scottish Premiership draw against St Johnstone in Perth on Saturday, writes Craig Goldthorp. On the balance of play – which saw St Johnstone enjoy 64 per cent possession and have eight goal attempts to the visitors’ four – this was a good point for the Fir Parkers. And ’Well will be delighted to have ended a dismal run at McDiarmid Park which had seen them lose all of their previous six visits. St Johnstone were the brighter side early on in this latest battle and Brian Easton had a shot deflected wide after Michael Coulson’s corner from the left. From the resultant flag kick, Murray Davidson headed over from a good position. But it was Motherwell who took an 11th minute lead from virtually their first attack and the goal was a disaster for Saints keeper Zander Clark. He somehow let Richard Tait’s fizzed cross from the right go out of his grasp and fumbled the ball into the net. Tait had initially been picked out by a fine Louis Moult pass. The fluke goal marked a refreshing change of luck for the Steelmen in a season which has seen them on the end of more than a few ropy refereeing decisions including at least two disallowed goals which should blatantly have stood. St Johnstone’s Steven MacLean then shot straight at Samson and Tam Scobbie had a header cleared from near the ‘Well goal line by Craig Clay as the hosts responded to the early setback. The final chance of the first half arrived in stoppage time when Chris Millar’s cross from the right was met by a powerful MacLean header which Samson did well to stop. Samson then saved a Davidson header early in the second half before Moult fired well over at the other end after dispossessing Millar. The Steelmen conceded a soft equaliser on 61 minutes when Samson stopped a MacLean header and the ball bounced back to Chris Kane. His initial shot was blocked by the keeper but the ball ricocheted off Kane’s body and into the net. What was I saying earlier about ’Well’s luck changing? There was nearly another disaster for the away team two minutes later when Ben Heneghan sliced a cross from the left just wide of the far post. Play was then delayed for three minutes after Motherwell youngster Jack McMillan went down with cramp. He was eventually replaced by Ryan Bowman. Saints sub Blair Alston was clean through on the keeper after 82 minutes but Samson pulled off a fine save. ’Well saw it out to earn a precious point.